Mister Max: The Book of Lost Things by Cynthia Voigt. Book 1 in the Mister Max Series. Review: Max is one small boy on an old bicycle and has very strange eyes. His grandmother Grammie is a librarian. Ari is Max's tutor and he is a "lost child". Pia is a girl who helps Max solve his cases. Cynthia Voigt tells the story of an intelligent little boy, Max, basically living on his own. 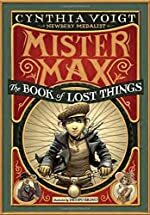 Mister Max: The Book of Lost Things is the first book of an amazing series of books about the adventures of Mister Max. Mister Max is a story about a boy, Max Starling, the son of two actors, William and Mary Starling, who gets invited to a ship called Flower of Kashmir. When Max gets to the harbor to board the ship, he finds that his parents are gone! The only thing left was a letter from his father saying that they cannot take him with them. Max, confused by the letter, turns to his grandmother, Grammie, for help. Max is, unsure of what to do and starts to work as an unlicensed "detective". While trying to uncover the secrets of his parents' disappearance, he meets two other people, Ari who is Max's math tutor, and Pia, a girl who hates people who show off their pets. Both characters help Max uncover the mysteries of his detective works. Cynthia Voigt is an excellent author. Because Max is also an actor, she writes good points about how Max uses his talent as an actor to solve mysteries that come his way. I disliked why Cynthia Voigt made Pia so annoying and why Ari is working so much or what he is up to with the money he earns. I like that she made up for these confusions with the quality of the book. It is well written and intriguing. Mister Max is highly recommended for 9-11 year olds or for younger high-level readers. We would like to thank Random House for providing a copy of Mister Max: The Book of Lost Things for this review. Have you read Mister Max: The Book of Lost Things? How would you rate it?